After you buy the plugin, you should receive an email receipt from Nose Graze. This email will contain a link to download a .zip file containing the plugin. Once you have the zubb-review-to-goodreads.zip file downloaded, login to your WordPress site. If you wish to enable automatic updates, you need to enter your license key. To do this, navigate to Ultimate BB » License. You'll see a new box there specifically for the Review to Goodreads License. Enter your key there and press "Save Changes". When the page reloads, you will need to click the Activate button below your license key. The key will not be activated until you click that button! The settings for the Review to Goodreads add-on are located in Ultimate BB » Add-Ons in the "Review to Goodreads" section. This is where you can configure the form fields and other settings. 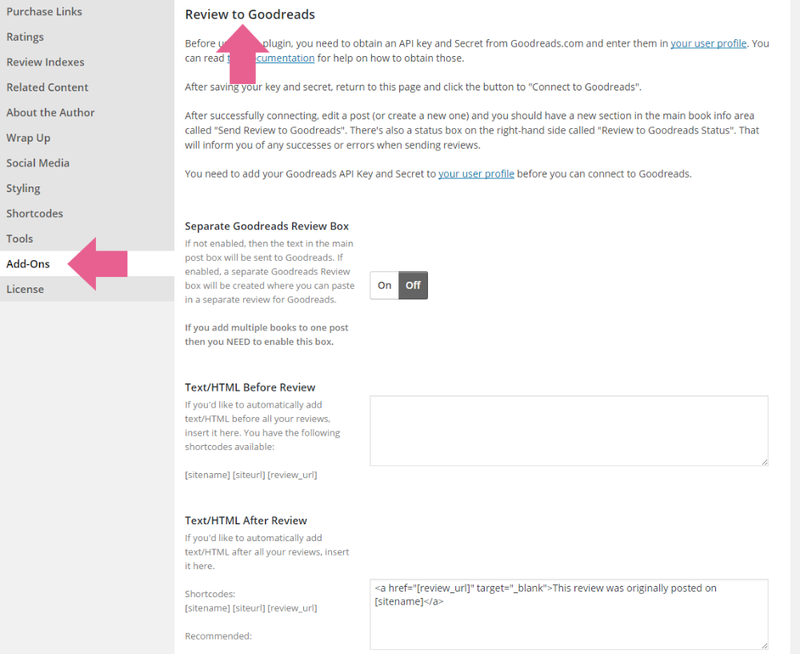 Before you can send your reviews to Goodreads, you need to establish a connection between your WordPress site and your Goodreads account. There's a box for your API Key and Secret. You have to obtain these from Goodreads. 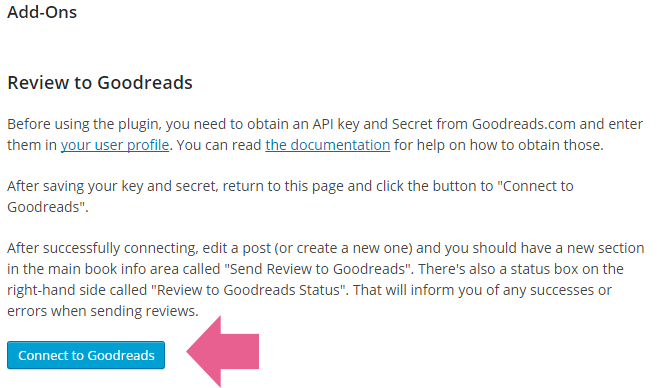 Please read through the instructions for getting your Goodreads API key. Once you have it, paste your API Key and Secret on your user profile page and save your changes. Once you have your key and secret entered, return to the Review to Goodreads settings page (Ultimate BB » Add-Ons). You'll see a new, blue button on the page called "Connect to Goodreads". Click that button to be forwarded to Goodreads, where you will be asked to authorize the connection. Accept the connection to complete this step. Click your avatar in the top right and select Account Settings. Click the "Apps" tab and scroll to the bottom. Find the application titled "no application" (weird, I know) and click "Revoke access". Login to WordPress and go to Ultimate BB > Add-Ons. Click the button to connect to Goodreads again. It should take you to the Goodreads website for approval, then send you back to your website with a success message. Then try sending your review again. If you create a new post (or edit an existing one) you'll see a new row in the UBB Book Information box called "Send Review to Goodreads". The one requirement for sending a review to Goodreads is that you MUST enter the Goodreads URL in the UBB Book Information Box. This URL is how the plugin knows which book on Goodreads to add your review to. So if you don't fill it out, your review will not be sent. Also keep in mind that you need to enter the Goodreads URL for the EXACT EDITION you want the review to be added to. So if you enter the URL for the Goodreads "Hardcover" edition, then your review will be added to the Hardcover edition. If you enter the URL for the Goodreads "Kindle" edition, then your review will be added to the Kindle edition. Do Not Send — This is the default. 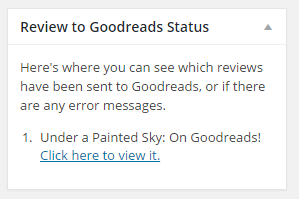 It means your review will NOT be sent to Goodreads. You can save your post as normal and nothing new or special will happen. Send Now — If you select this option and then save your post (publish, schedule, save as draft, etc.) the review will be sent off to Goodreads immediately. Send When Post is Published — If you select this option and then save your post, the post will be scheduled to be sent to Goodreads when it is published. For example, if you select this option, then schedule your post for 2 weeks into the future, the review will not be sent to Goodreads straight away. But it will be sent automatically once the post becomes published. Before sending now, save your post! Keep "Send Review to Goodreads" set as "Do Not Send". Save the post in some way (save as draft, schedule, publish, etc. — any method of saving). When the page refreshes, switch the "Send Review to Goodreads" option to "Send Now". The important thing to note is that you save everything BEFORE sending the review to Goodreads. This is the best way to ensure that everything gets sent properly. There's a handy box on the right-hand side of your Edit Post page that will keep you updated with the status of your Goodreads submissions. If a review has been submitted successfully, it will link you to the review on Goodreads (as shown in the screenshot). If there are any errors during the submission process, they will also be listed in that box.